Well, my project is not part of source control, yet the same icons are there. So there must be more to it. UPDATE: Bacalso Vincent is correct, I did enable GIT on creating the project. I had completely forgotten about that though. 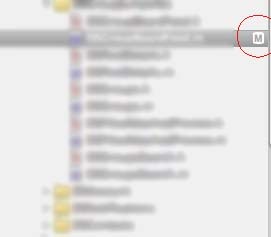 What do the “M” and “A” icons in the Project Navigator of Xcode 4 mean when I create a new project?